Balance your body, Balance your life! If you want a real good quality blender with lowest price for your delicious smoothies, shakes or icy drinks, you can contact us! Our products will make you feel at ease and easy to use. Bestom powerful and versatile 1800W blender with 36000-peak achieve a fast and efficient use. Easy operation and instantly grind at high speed and keep food fresh, give you balanced nutrition. Bestom professional blender equips 6-pieces solid and sharp blades to create a powerful vortex that is fast and thorough for exceptional blending results. Made from stainless steel component and Non-BPA plastic jug, an ultra-safe food grade material for food and drink consumption, rest assure to create and enjoy your various delicious drinks and foods. Hardened stainless-steel bearing easy to handle the toughest ingredients which allowing better and safer blend and longer working life and enjoying your great-tasting blends. Dimension: 7.48" x 8.66" x 19.19"
1. Never overfill. Do NOT exceed the "Max" line. 2. Unplug from power socket when blender is not in use. 3. The cover can only be opened when the blade has completely stopped rotating. 4. When cleaning, ensure that you unplug the appliance, the jug can be washed separately(Blades are sharp, please handle with care). 5. Do not submerge the motorized blender base in water or place in the dishwasher. 6. When in use, keep children away to prevent accidents. PROFESSIONAL PERFORMANCE: Nearly 2.5 hp motor with 36,000RPM. 1800 Watt motor provides fast and efficient ice crushing, blending, pureeing and processing. Precision speed control and pulse features make it easy to produce just the right consistency with any ingredients in any recipe. MULTIFUNCTIONAL & LARGE CAPACITY: Bestom blender = Juicer + Food Processor+ Grinder+ Milkshake Blender + Soymilk maker + Ice Crusher. Large capacity(70-ounce) BPA-free Container is perfect for family meals,entertaining and commercial. 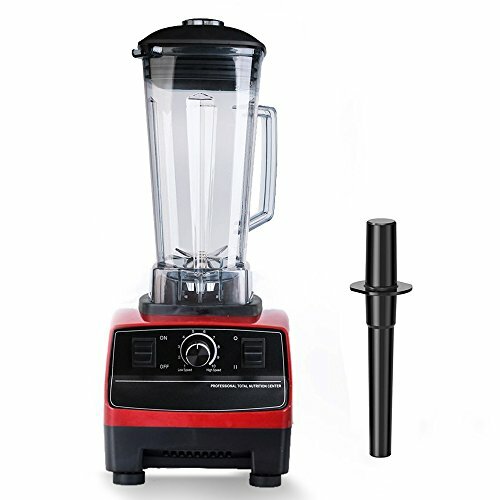 STAINLESS STEEL BLADE: Blender design with optimized 6 stainless steel blades and electronic controls combine to create a powerful vortex that make it easy to get maximum nutrient & vitamin from the crushing through whole fruits, vegetables & ice in seconds. SAFETY MATERIAL & PROTECT: Food-grade high hardness pitcher (FDA certified), no Bisphenol A included, heat-resistant, anti acid and alkaline, healthy and durable. SERVICE AND GUARANTEE: In order to make you have a pleasant shopping experience, we promise to provide 1 - year warranty and 30 - day refund guarantee.If you have any questions about using or buying, please email us, we will reply you in 24 hours. If you have any questions about this product by Bestom, contact us by completing and submitting the form below. If you are looking for a specif part number, please include it with your message.